“The Columbian Exchange and landscapes of the Middle Rio Grande Valley, AD 1300-1900” is an examination of the impact of Spanish colonization including what people were eating, and an indication of what animals and plants were abundant in the area. But Jones says animal bones from archeological sites suggest no immediate major impact on the landscape. Jones’ research focuses on the “Columbian Exchange” or the transformation of landscapes that came with contact between the old and new world. 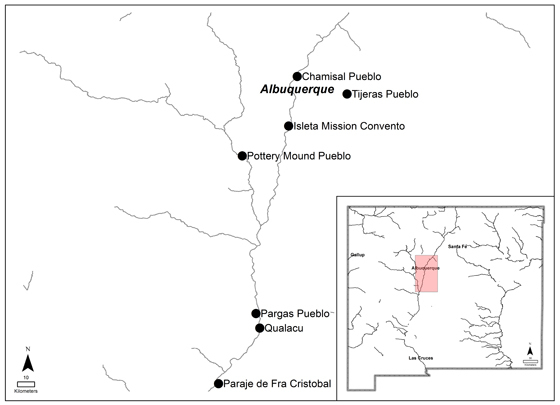 For this paper she examined archeological faunal materials from a number of historic pueblos, missions and villages – essentially the bones left if the trash heaps to determine the animal portion of historic people’s diets. Study sites in the Middle Rio Grande Valley.